Here’s your big mistake on those World Cup brackets. Many of the people who’ve filled out brackets on the Bloomberg terminal seem to have forgotten that matches can end three ways, not two. There is win, and there is lose. And in the World Cup’s group stage, there is draw. 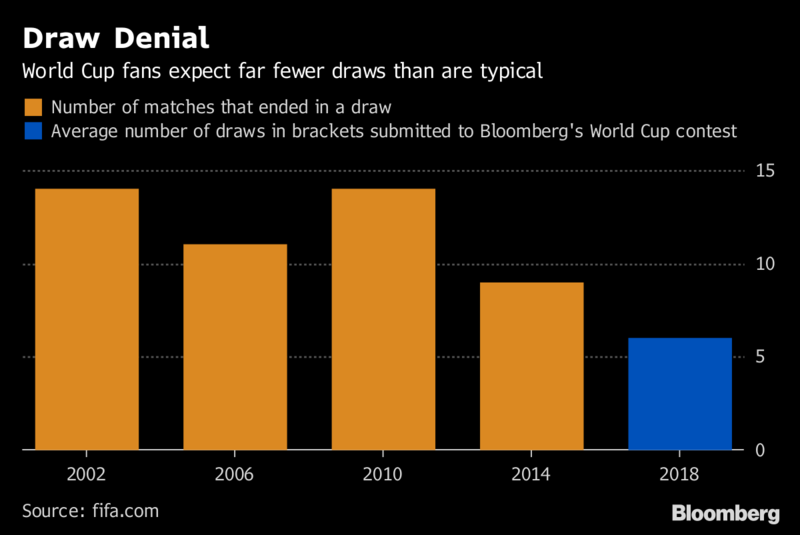 But the 28,000 Bloomberg brackets vastly understate the prevalence of draws in the World Cup. On average, people entered six draws for the group stage’s 48 games. Over the past four tournaments, the average number of draws was double that, at 12. Almost a quarter of entrants selected no draws at all. What gives? Behavioral economics, which delves into the psychology of decision-making, provides a few possible answers. One is that people have built-in biases. We tend to remember the thrilling victories and big upsets. Draws are easier to forget, even though they happen regularly. Ran Shorrer, an economics professor at Penn State, also suggests it’s a case of mismatched incentives. Another possibility is simple overconfidence. Sports fans are rarely mistaken for being meek. “Draws are, or in some sense reflect, the opposite of overconfidence and risk taking” said economist Ignacio Palacios-Huerta of the London School of Economics. And sure, it’s just more fun to pick a winner than to seemingly not make a choice at all suggested Yale School of Management finance professor Tobias Moskowitz. Three of the first eleven matches of the 2018 World Cup have ended in draws, including a thriller between Portugal and Spain in which Cristiano Ronaldo recorded a hat trick.